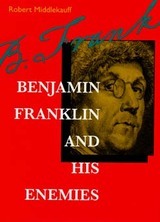 In this engaging study of the much-loved statesman and polymath, Robert Middlekauff uncovers a little-known aspect of Benjamin Franklin's personality—his passionate anger. He reveals a fully human Franklin who led a remarkable life but nonetheless had his share of hostile relationships—political adversaries like the Penns, John Adams, and Arthur Lee—and great disappointments—the most significant being his son, William, who sided with the British. Utilizing an abundance of archival sources, Middlekauff weaves episodes in Franklin's emotional life into key moments in colonial and Revolutionary history. The result is a highly readable narrative that illuminates how historical passions can torment even the most rational and benevolent of men. Robert Middlekauff is Preston Hotchkis Professor of American History at the University of California, Berkeley. His books include The Mathers: Three Generations of Puritan Intellectuals (1971), which won the Bancroft Prize, and The Glorious Cause: The American Revolution (1982), which won the Commonwealth Club Gold Medal.